Huge Congratulations to Sian and David who were married in a church service and celebrated their wedding at Top Meadow Golf Club near Upminster, Essex. The colour scheme was pale blue and white which was replicated in their wedding cake – 4 tiers of gorgeousness! 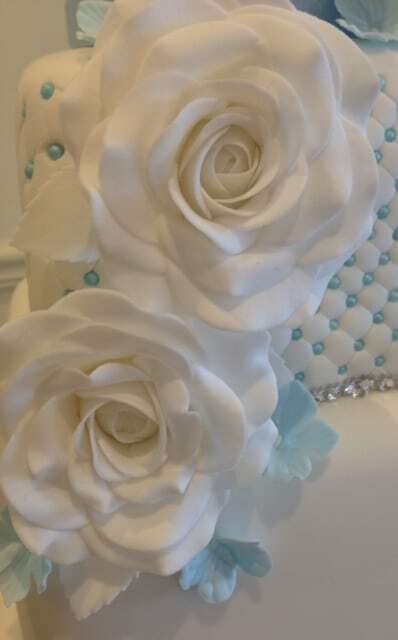 The happy couple chose to have a square wedding cake, with a quilting design on 2 tiers, white roses, blue hydrangea petals and blue butterflies, all made from sugar with diamante picks and trimming for an added bit of sparkle. The flavours they chose were Madagascan Vanilla, White Chocolate & Passion Fruit, Zesty Orange and the top tier was a traditional Fruitcake, which they were keeping for a later date. I wish you both a lifetime of happiness together, it was a joy working with you.